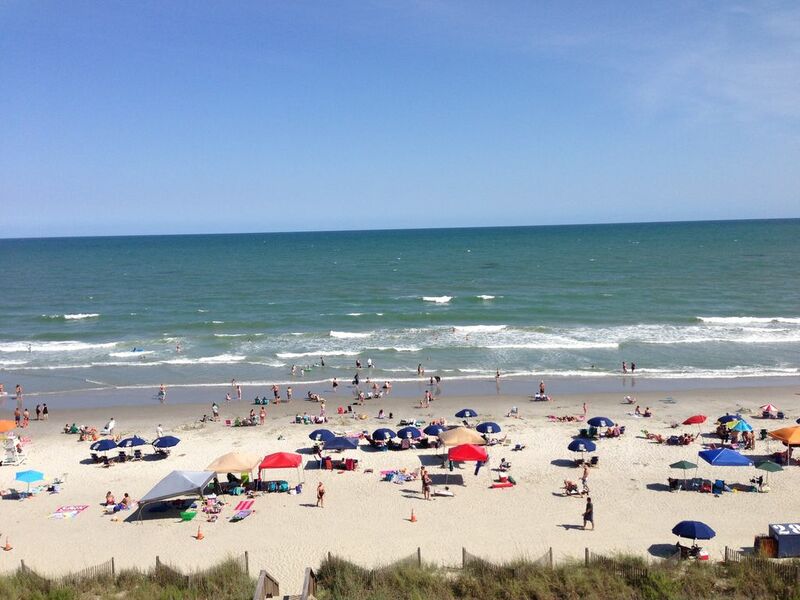 Our privately owned condominium is located in Crescent Shores which is an oceanfront resort in North Myrtle Beach. Lounge in the recliners in our spacious living room with huge windows which reveal a beautiful panoramic view of the ocean. The extra large balcony, accessible from living area and the master bedroom, is located five stories above the pool and provides privacy from nearby units. Our unit is tastefully decorated in vibrant colors. The full kitchen includes new stainless steel appliances, all standard utensils and a new full sized washer and dryer. The living area has a 44 inch flat screen television, a Blu-ray player, and high speed internet. The master bedroom contains a king sized bed, marble whirlpool tub and television with a DVD player. Each additional bedroom has two queen sized beds and 24' flat screen televisions with integrated DVD players. All bathrooms have been updated with new fixtures. Our guests may enjoy the outdoor pool, lazy river, two oceanfront oversized hot tubs, enclosed pool, and exercise room. Linens (except towels), Cookware, and Utensils are provided. Departure cleaning is included except for partial week rentals. Sorry No Pets, No smoking allowed due to consideration of our family's allergies. Hi Everyone, We have been long time visitors to Myrtle Beach and frequent visitors to Crescent Shores so in 2017 we took the plunge and became owners. We are new at VRBO but are here to make your stay with us as comfortable and memorable as possible. We appreciate any and all feedback. Welcome to our Happy Place!! The property is ideally located and has all of the amenities to make your vacation memorable. Unit is owner managed and exceptionally clean. The Master bathroom has just been updated! All linens provided except for beach and bath towels. There is parking under the building and also across the street in a covered garage. Couch and love seat are also recliners. There is seating for six at the table and 3 at the bar. Spectacular views of the ocean and sunsets. Seating for 6! Just finished our week at Crescent Shores 507—everything was as advertised or better! Our hosts, Bob and Kathy, provided everything we would need for an excellent stay and were quick to respond to any questions we had before and during our vacation. The condo was immaculate and well maintained—gladly give the property and our hosts “five stars”! Clean, plenty of room, great view! Overall, this place was fantastic! When we got there, the room was extremely clean and welcoming. There was more than enough room for us and plenty of space for our kids (4 and 2) to run around without the fear of them bumping and breaking something! The balcony was a great size and was perfect for morning coffee and watching the sunrise! Bob & Kathy were accommodating, quick to respond upon booking, and had definitely put work into making sure our stay was comfortable. I Highly recommend this place for anyone, but especially families with children. Getting to and from the pool and ocean from the condo was a breeze (even when carrying floats, sand toys, chairs, diaper bags, kids, etc). Great condo and awesome people to deal with. We had a great time on our vacation! We loved the condo. It was very clean, roomy, and well stocked with things you might need. We have been staying in condos on the beach for 25 years and never have we had so many beach chairs, umbrellas, and boogie boards there for our use. We are a big group and we always had plenty of dishes, pots and pans, glasses, silverware and any kind of appliances we might have needed. There was also plenty of dish detergent, dishwasher detergent, paper towels and trash bags. These are things I have ALWAYS had to buy in the past. The Pool was nice and the lazy river was enjoyed by all! The elevators were fast, which if you have stayed many places, you know that is a bonus. The only draw back we found was the parking. It got very old going down one elevator, then cross the street, then go up another elevator to find your car. But honestly this is something the owners have no control over. I would highly recommended this condo. It’s hard to find this much room in the newer condos. Great place to stay and great people to deal with!! Thanks Tammy for your kind review!! Please consider staying with us again when you come to the beach! Safe travels! We stayed in this cute place for the weekend. Very neat and clean. Sue was so accommodating. We had everything we needed. The weather was great. I would definitely stay here again. Great location. Quiet, clean and comfortable. Along with our daughter and grandchildren, we enjoyed a beautiful week at the beach at the nicest, cleanest condo we have ever rented. Renting has never been so easy. Sue was amazing to work with. Everything was in pristine condition. Unfortunately , we can't gather everyone together this year. If we could I would insist we rent this condo again. If you are reading this, you must be looking for a rental. Look no further than this one. You won't regret it! ALL PRICES INCLUDE TAXES, Bed Linens and departure cleaning. Monthly Rentals Available January-May October November December Call or email for more info. Lock out fee is $50 plus the cost of the locksmith if one must be called. This will be taken out of damage protection fee.